COREreadiness is a unique, pharmacy-specific online learning platform featuring hundreds of courses taught by industry experts. Its dedicated to preparing pharmacy students, pharmacy professionals, and practitioners for the pharmacy workplace. 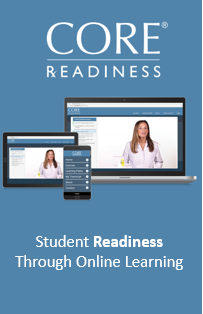 COREreadiness courses are comprised of engaging multimedia content covering niche pharmacy marketing subjects, professional skills, technology, practice settings, company overviews and more. 100% self paced, online education. Infused with top industry leaders in the profession. Course development and ongoing support. Certificates of completion and transcripts. Enhance on-boarding and professional development of staff. Educate the pharmacy market on product and service offerings. Supplement pharmacy students' experiential education. Support preceptors by relieving student training burden. Prepare professionals new to the pharmacy market. Enhance practicing pharmacists' career potential. CORE ELMS is a web-based ELMS (Experiential Learning Management System) that serves the needs of experiential and externship departments within higher education. CORE ELMS provides communication, accountability, and efficiency tools that save time and money by streamlining department operations and accreditation data collection processes. Supported by attentive and knowledgeable customer service, CORE ELMS allows for detailed student, site and supervisor management. CORE ELMS also provides externship scheduling management, student evaluation, hours tracking and LDA list management, student competency management, as well as student requirements and immunization tracking. CORE ELMS is customizable and scalable to fit within your program's specific needs and budget. What is an ELMS and How Can it Benefit an Experiential Learning & Education Program? An Experiential Learning Management System, or ELMS, is a software application used by Higher Educational Institutions' experiential learning departments to manage the experiential education component of a program's curriculum (experiential learning, experiential education & service learning). ELMS platforms offer an innovative, comprehensive and efficient approach to operational management and include tools to meet all of an Experiential Learning departments needs. Simply stated, an ELMS automates the scheduling, daily tasks, administration and reporting of all required experiential education functions. Comprehensive ELMS software should include many the unique features that are imperative to meet the requirements of dynamic experiential education departments. An effective ELMS should save the experiential/externship department time and money by increasing operational efficiencies (extern scheduling, reporting, communication, data management, etc). Depending on the size and complexity of the department, a robust ELMS should save 0.5 to 3 FTEs. An effective ELMS should help the school avoid accreditation, compliance, and LDA issues by efficiently managing critical data associated with experiential education (student hours worked, immunizations, background checks, student competencies, student evaluations, site contracts, etc). An effective ELMS should enable efficient, three-way communication between the three account types: Department Administrators, Students, and Preceptors/Sites in the field. An effective ELMS should provide a standard platform for operational/process standardization, document management, and succession planning for inevitable staff turnover within the department. An state-of-the-art ELMS should foster an image of "efficiency and innovation" to the school's preceptors (many of which are potential employers and alumni). Experiential learning nomenclature for preceptors, externships, and specific processes within a particular program are diverse. Examples include: intern scheduling systems; resident management software; Cooperative Teacher scheduling; externship site coordinator; Cooperative Teacher management; clerkship management tools; PLE rotation scheduling software; Clinical Coordinator and clinicals scheduling; Site Coordinator internship and sponsor scheduling solutions; advanced rotation scheduling system; student internship management; clerkship management software; externship organization tool. 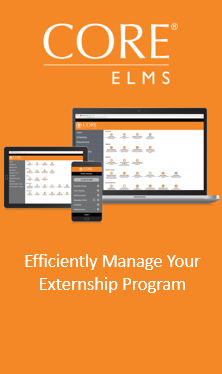 Efficiently manage your externship program and improve communication, organization, and accountability with CORE ELMS software. From scheduling to evaluations, site management to hours tracking, CORE ELMS software manages every aspect of your externship/clinical process. Comprehensive technology and exceptional customer service, all at a reasonable price. Experience Matters | Student externship management and marketplace readiness. 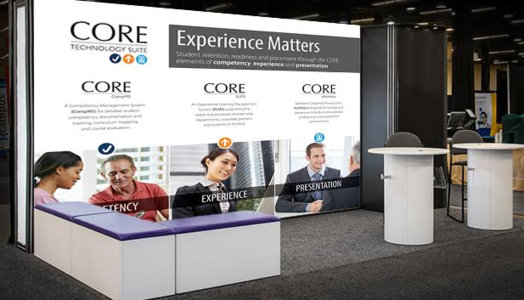 CORE ELMS is a SaaS ELMS (Experiential Learning Management System) that serves the needs of experiential and externship departments within higher education. CORE ELMS provides communication, accountability, and efficiency tools that save time and money by streamlining department operations and accreditation data collection processes.